We are the proud Platinum sponsors of the Bold ideas, better solutions symposium being held in November by The Hopkins Centre. 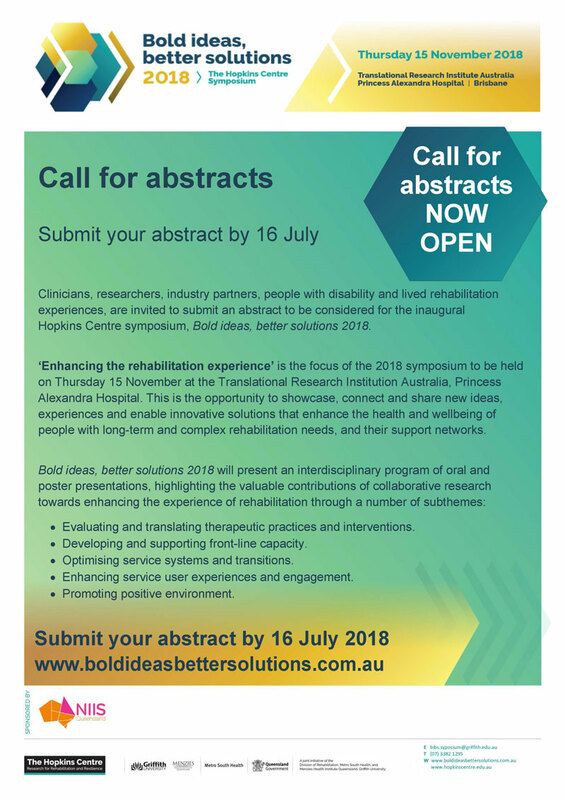 Bold ideas, better solutions 2018 will highlight the valuable contributions of collaborative research through ‘enhancing the experience of rehabilitation’ as the theme of the event. This will provide the opportunity to showcase, connect and share new ideas, experiences and enable innovative solutions that enhance the health and well-being of people with long-term and complex rehabilitation needs, and their support networks. The NIISQ Photographic exhibition will also feature at the symposium. The Hopkins Centre are now inviting clinicians, researchers, industry partners, people with disability and lived rehabilitation experiences to submit an abstract to be considered for symposium. Further details are found at: www.boldideasbettersolutions.com.au.